There are currently two guest cottages available to rent: Shotters Mews and Shotters Cottage, which are almost adjacent to The Long Barn. These are available for two to three nights (or longer) at reasonable rates for wedding and event bookings. Both residences are perfect for a countryside retreat, offering spacious bedrooms, a countryside-infused kitchen diner and a snug to cosy down in at the end of a tiring day. There is a large patio and a private tennis court, perfect to entertain both the family and your guests. 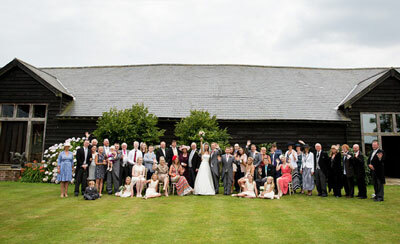 This accommodation has proved to be a great success for previous weddings and events. The venue offers a small and discrete Bridal/Changing Room for the Bride and Groom’s own personal use, with its own shower/washroom to prepare and relax with your loved ones before your big day. The Bridal Room is connected to the muse that has access to the barn.